KOKO’s Love is multifaceted and manifests itself in different forms, such as a single-channel video, a video installation/sculpture, and painting. I have used tropes from East-Asian soap operas to create my version of an East-Asian/Asian-American hybrid soap in KOKO's Love: Episode 1, about a Japanese-American family, whose patriarch is a liquor store owner in South Los Angeles that annoyingly insists on the importance of having a male inherit the family business and not a female, his only child, a daughter. It explores the intersectionality of expectations and perceptions of gender roles of women and men, exposing the absurdity of the male hegemonic structure in the contemporary Asian-American family. KOKO’s Love has been exhibited as an installation in a created home environment, as well as being embedded in a fresco foam sculpture of a hybrid “Kokeshi” doll, a traditional wooden Japanese doll, which was carved to ward off fires and evil, especially in regards to a prosperous business. 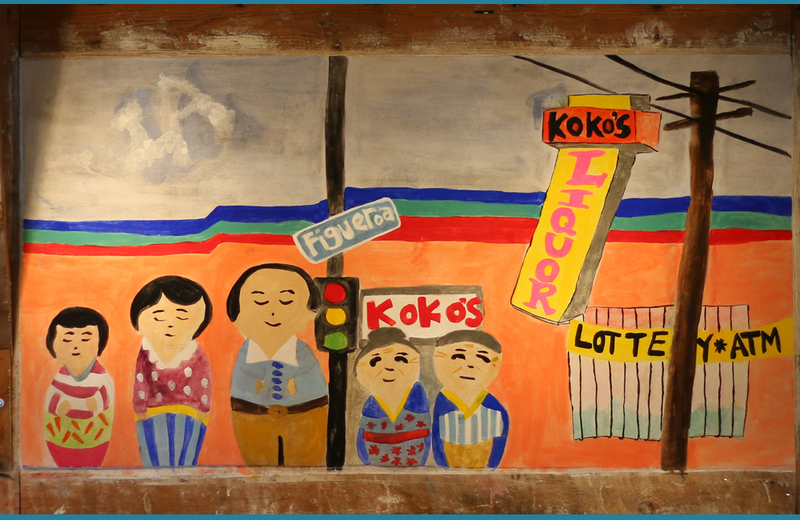 The “Kokeshi” sculpture, inspired by a fresco painting (48” x 88”) investigating my personal history, portrays a multigenerational Japanese-American family as stylized “Kokeshi.” The liquor store business was run by many Japanese-Americans to financially support their families, and Koko’s Liquor is a store my father ran for 20 years.